Much of the effort and energy it takes to mix and pour cement, grout, mortar, texture coatings, sealants, adhesives and other self-leveling compounds can be alleviated by using a portable mixer such as a HIPPO mixer from CS Unitec. Now, you can further reduce your crew’s physical effort while boosting productivity and lowering labor costs with the newest portable mixer model. 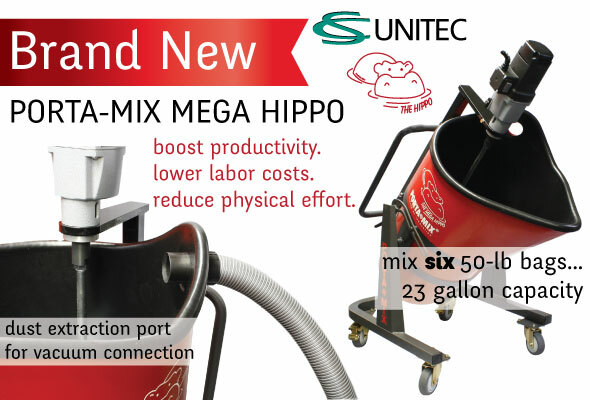 If you want to upgrade your concrete and cement mixing machines or portable mixer stations, Runyon Surface Prep carries a full line of CS Unitec concrete HIPPO mixers, paddles and hand grinders for all your surface preparation needs, including the new Portamix MEGA HIPPO model. Today, artisan crafted, decorative concrete or terrazzo countertops are growing in popularity, because each creation is not only unique, it’s also a masterpiece of design. The use of glass aggregate introduces a third dimension to the surface that plays off of light and color, creating a richness and depth worthy of its glorious shine. Prepare and place your concrete as you normally do. Bull float the concrete to smooth out the surface, but don’t rough trowel or finish trowel your project. 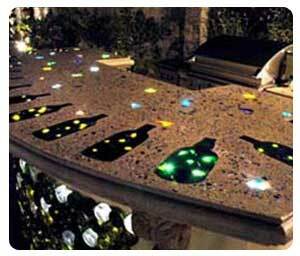 Spread the glass out evenly – or in a pattern – on your concrete surface using any quantity, colors and mixes of glass that you desire. Lightly trowel the glass into the still-wet concrete, gently pushing the glass into the surface, taking care not to push the glass too far in, or your finishing, grinding and polishing process will take longer. For a bolder finish, leave Pea gravel, compacted substrate, even some of the higher glass tips on the surface or sticking out of the concrete. Cure concrete for about seven days, enough time to avoid damaging the surface by finishing too early, or damaging your tools by finishing too late. Begin grinding the concrete surface with a 50-grit diamond grinding pad. Increase to a 100 grit, then 200 grit and continue increasing the grit until you achieve the finish and polish you’re looking for. Avoid scratching or scarring the concrete by wetting the surface during the entire grinding process to reduce friction between the pad and the concrete. Sweep, vacuum or wash the surface (often with muriatic acid) to remove dust. Apply a sealer of your choice, carefully following the manufacturer’s recommendations. When you’re looking for quality glass chips for use in decorative concrete countertops, count on Runyon Surface Prep. We carry American Specialty Glass products. ASG recommends adding an acrylic fortifier to the concrete mix to help with the adhesion of the concrete to the glass and other aggregates. Using a retarding product on your concrete surface before spreading the glass chips can also increase the working time. The use of glass adds a unique decorative element to concrete. How the glass is applied, the quantities of glass used and the mixes of colors chosen creates a customized design for a floor, countertop or other decorative concrete product limited only by the imagination. Glass is used to create the ancient art known as terrazzo, which uses chips of glass, marble or similar material fixed in tinted cement, then ground and polished to a smooth sheen. Its beauty was discovered by mosaic craft workers in 15th century Italy, after noticing how small marble chips left on a terrace pushed into the surface, smoothed by foot traffic over time. The effect not only makes the floor unique, it strengthens the surface as well. Nowadays, architects and designers all over the world use the extremely durable terrazzo to create one-of-a-kind floors using vibrant, modern colors and transform environmentally sustainable surfaces into a stunning work of art. 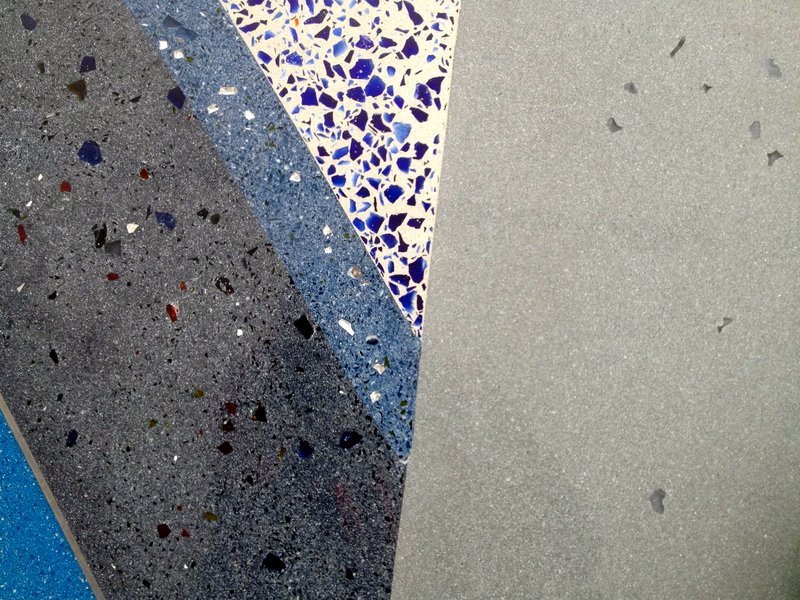 In this article, we’ll explore one of the most common applications of glass in creating terrazzo: integrally mixing. The process replaces all or a portion of the aggregate in a concrete mixture with recycled glass chips, creating a uniform look of glass aggregate and concrete in the finished product. Integrally mixing uses much more glass than other applications such as seeding, which will be discussed in our next article. Replace traditional aggregate content with recycled glass chips on a 50/50 or any other percentage. If a 6-bag mix that requires 100 lbs of aggregate per batch, replace all or a portion of the 100 lbs with glass. More glass provides a more colorful finish, whereas less glass leaves a more subtle color. Mix, pour, bull-float, rough trowel and finish trowel the concrete. When you’re looking for quality glass for use in decorative concrete like terrazzo, count on Runyon Surface Prep. We carry American Specialty Glass products. ASG always recommends adding the fine glass product (ground glass minus 30 mesh) to your mixture when glass aggregates are used. The silica in the fine glass chemically reacts well with the cement to better bond the concrete mixture to the glass. The fine glass is lighter in color and is great for subtle color effects in concrete. Type of Concrete. Typically, a pure color dye will change slightly, due to the minerals in the concrete, taking on a lighter or darker shade, which can also change with time. Adjust the dye color to the type of concrete for the desired shade. UV Light Stability. Sunlight can damage dyed concrete floors, causing vibrant colors to fade. Check if windows in the room are made with glass containing UV-protection, which can keep floor color from fading. Moisture Vapor Test. When moisture in concrete brings salts to the surface, it causes dyes to seep deeper into the floor, diluting their color. Testing for efflorescence cannot only root out a bigger moisture issue, it indicates whether water will cause the color to diminish. Use Stain. Concrete stains work differently than dyes, reacting chemically with the concrete to create color that is more resistant to fading from sunlight or moisture. Apply Guard. A proper guard provides long-lasting, breathable protection for the floor and its color. Apply after polishing. When you’re looking for quality concrete dyes and sealers, count on Runyon Surface Prep. We carry two of the top-rated concrete dyes and sealant brands in the business. AmeriPolish products assure perfect color that resists fading through cleanings, scrubbings and traffic. Prosoco products are designed to improve the appearance and performance of architectural masonry for years to come.